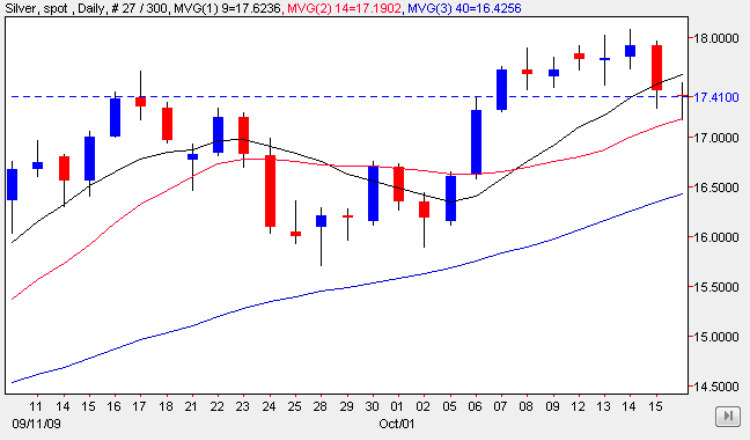 The technical picture for silver spot prices is much the same as for gold prices, with the silver market ending the week with a hammer candle, which in this case found support from the 14 day moving average ( spot gold found support at the 9 day moving average), suggesting that this reversal may only be a short term pullback as the market takes a breather before moving higher once again. Indeed this analysis would seem to be confirmed by the $17.40 price level which also provided a degree of support, and whilst only a minor area of consolidation, suggests that silver prices have found some traction at this level. With all three moving averages pointing firmly higher, there is nothing at present to suggest that the current bullish trend has run it’s course, and we should therefore look for a resumption of the upwards price move for spot silver in due course, with a break above the $18.50 resistance level as our initial target.